I have a bit of a mug addiction! I have all sorts – florals, funny, souvenir types and lots more. My favorite go-to’s are my cat mugs! 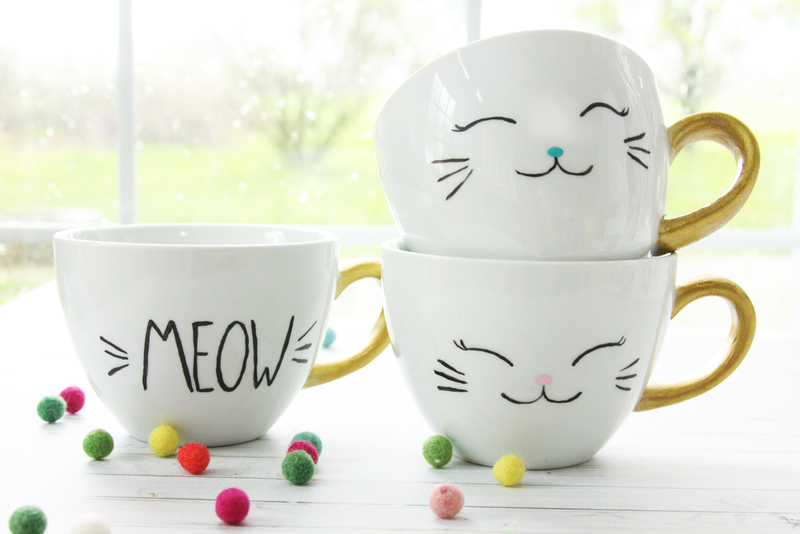 I thought it was high time I made some myself so I broke out the paints and Mod Podge and made these DIY Painted & Dishwasher Safe Cat Mugs! 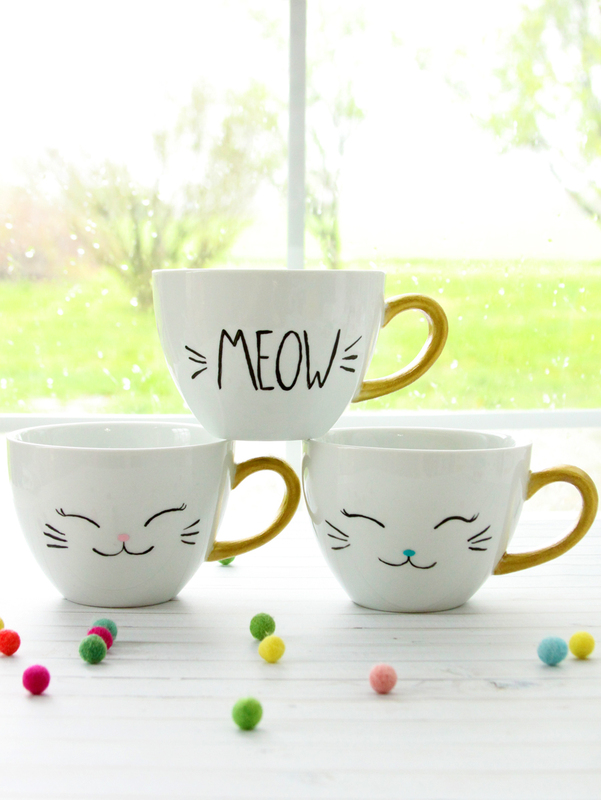 They are super simple to make – you just need a little paint, some brushes and the Dishwasher Safe Mod Podge! And a mug or three. :) Because once you get started, it’s so much fun to keep painting! They’re a great way to celebrate National Mod Podge day too! More info on that at the end of the post – but there’s all kinds of awesomeness you don’t want to miss out on! Mug(s) – the supplies here will do several mugs! 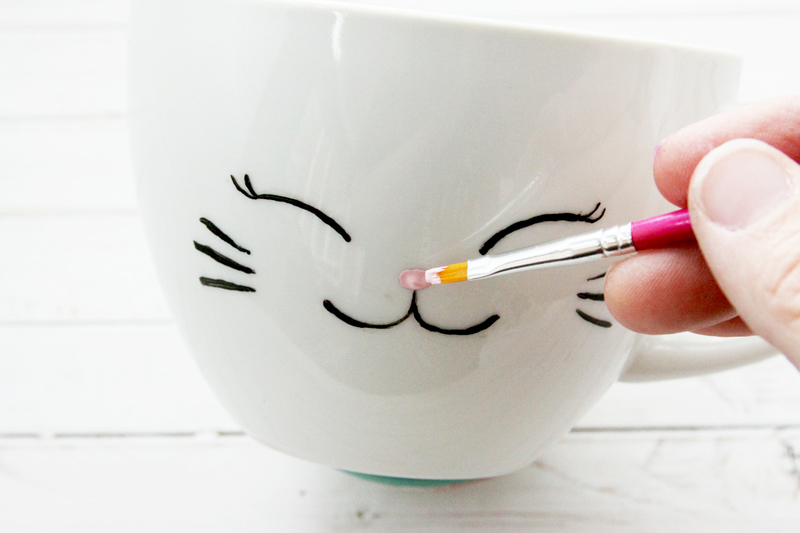 Before you start painting, make sure your mugs are clean and dry. Start by sketching out your design with a pencil. If you go over it a couple of times, the pencil will make a light line on the mug for you to follow. Keep your design at least 1″ below the rim of your mug. 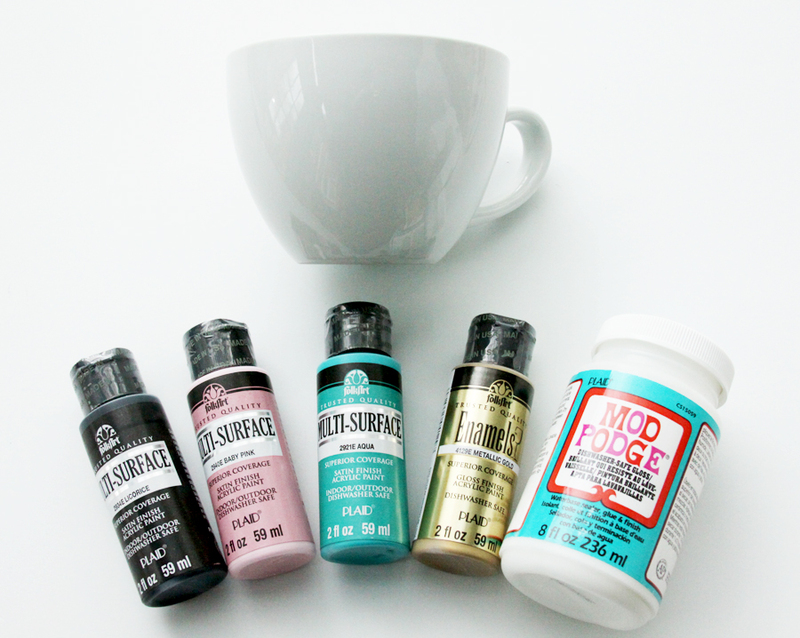 The paint and Mod Podge are non-toxic but you still want to keep them a safe distance away from the rim of the mug. The Multi-Surface paint is dishwasher safe but I wanted an extra layer of protection in washing them with the Dishwasher Safe Mod Podge. Dip your fine line brush in the Licorice paint and brush off a little of the paint on your palette so you have a nice fine line. Draw on your cat’s eyes, eyelashes, whiskers, and mouth. Try to keep them as even as possible. If you need to, wipe the paint off with a damp cloth before it dries and start over. It’s super easy to clean off at this stage. Using the colored paint, paint on the nose. 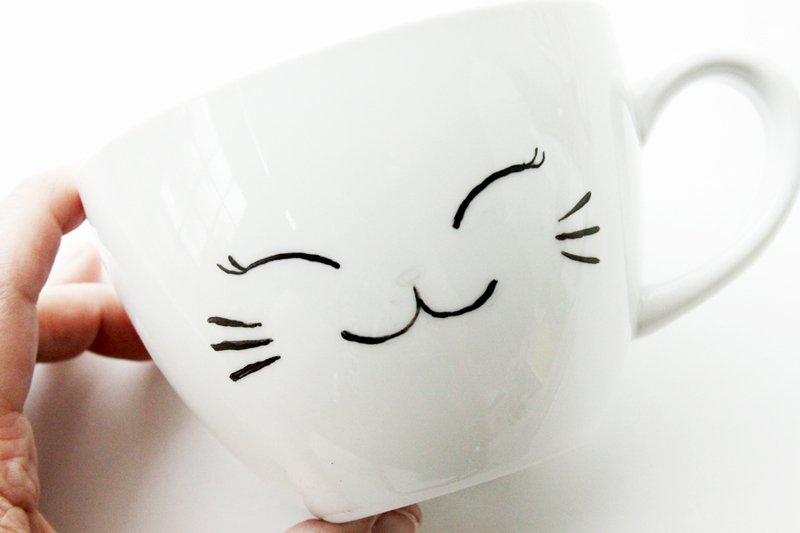 I did one mug with a pink nose and one with an aqua nose. These little faces make me so happy!! 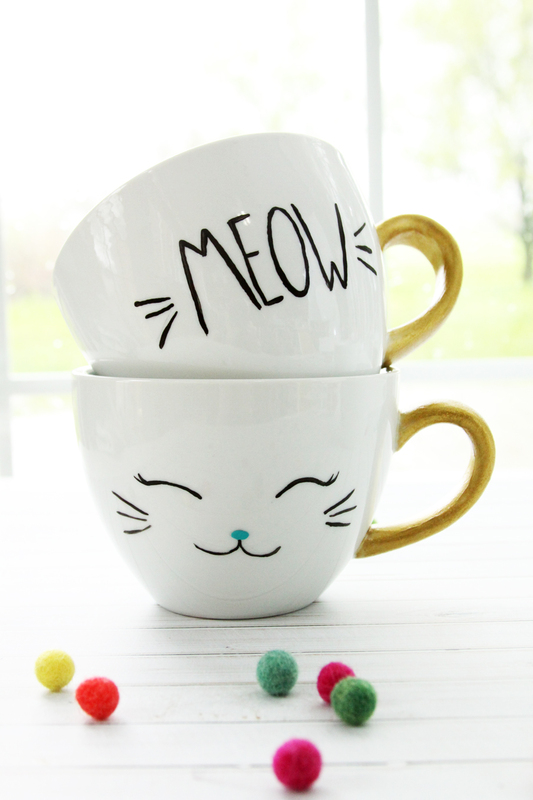 You can also paint one with the phrase MEOW with whiskers on each side. I found it easiest to practice writing the word with a pencil first, then tracing it onto the design. I kept mine with a blocky font, but a hand lettering script would be super fun too! Now onto the handle! 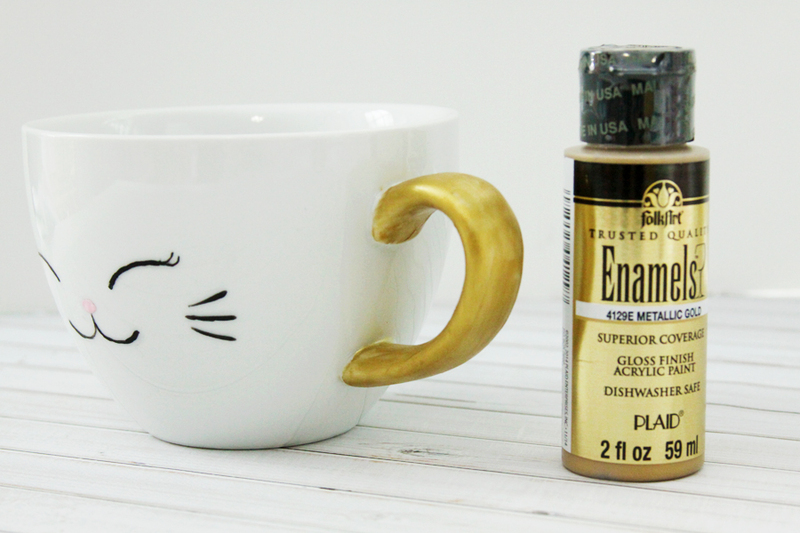 Paint the handles of the mugs first with the FolkArt Enamels Gold paint. This will give it a great color and make the glitter paint stand out even more. Paint as many layers as you’d like, until the gold is as dark as you’d like. 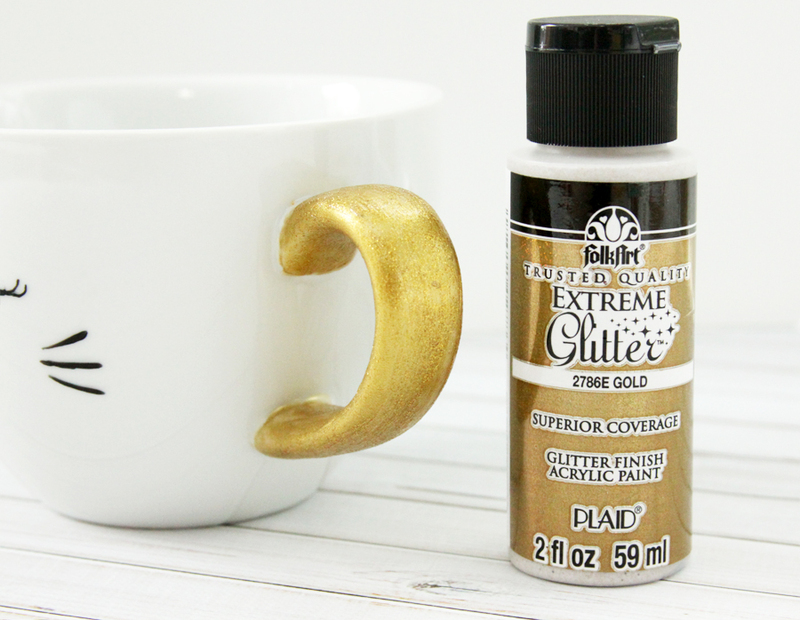 Once the gold enamels is dry, cover the handle with the FolkArt Extreme Glitter. Again, keep painting until your handle is as glittery as you’d like. It’s a little hard to tell in the photo, but the handle has a super pretty fine glittery look to it! Once your paints are all dry, brush on the Dishwasher Safe Mod Podge Gloss, over the face and the handle. Follow the instructions on the bottle for coverage and cure time. The Mod Podge has a 28 day cure time – and once it’s cured you can put it in the top rack of the dishwasher for cleaning! I can personally swear by it as well – I’ve made a glitter mug and a fabric mod-podged mug and they are both still holding up great!! Aren’t they cute? 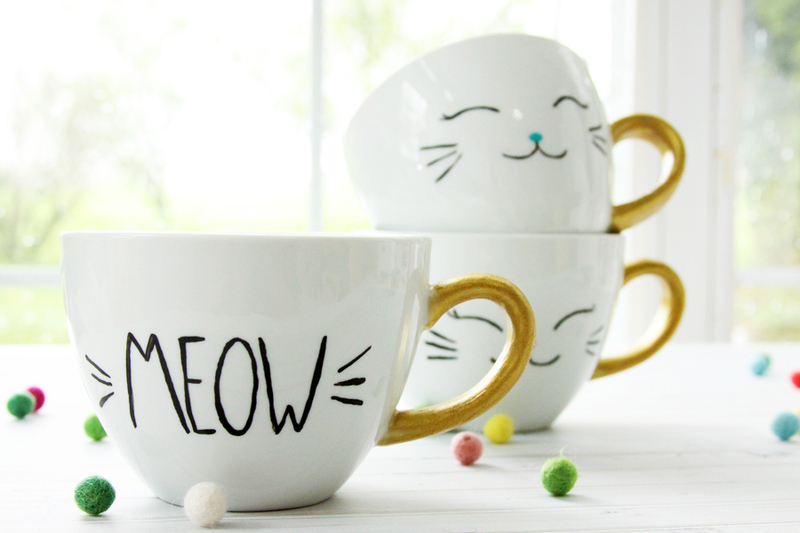 They’d be perfect gifts for a cat-loving friend too! 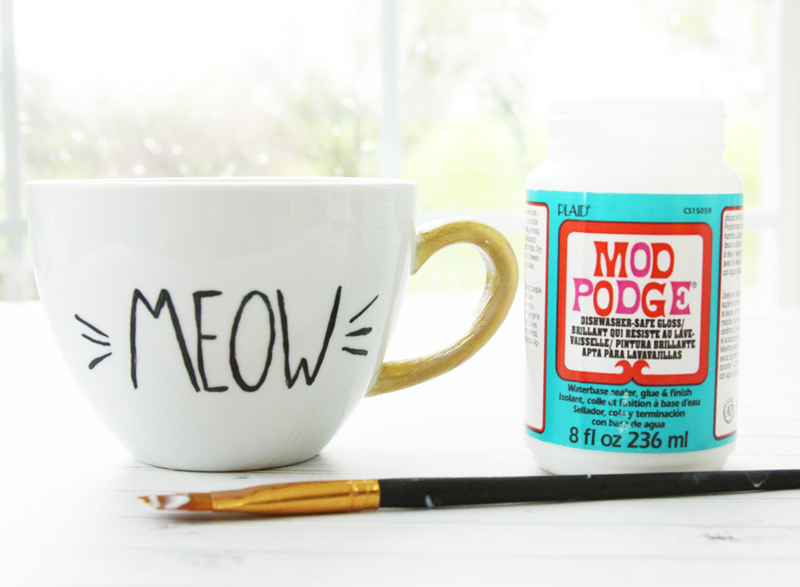 Friday, May 18th is National Mod Podge Day! We’re celebrating all things Mod Podge – share your favorite Mod Podge creations as a public Instagram feed post with #NationalModPodgeDay throughout the month of May for a chance to win weekly Mod Podge prize packs from Plaid – check out this post for more info! Plaid will also feature live streams leading up to National Mod Podge Day, so be sure to follow them on social. I’ll be doing a Live Stream tutorial on how to make these cute mugs on May 14 on the Plaid Facebook page so make sure to tune in for that! Find more fabulous Mod Podge projects at the other Plaid Creators websites! These are adorable! I love coffee mugs of all kinds too! Can you use them before the end of the 28 day cure time and just hand wash them or should I wait the full time? Thanks for cute idea! I’m so glad you like them! I double checked with Plaid and you do need to let the mugs air dry for the full 28 days – if they are washed it puts moisture back into the seal. Let me know if you have any other questions! I have the same question as Vanessa, about using before the 28 days. 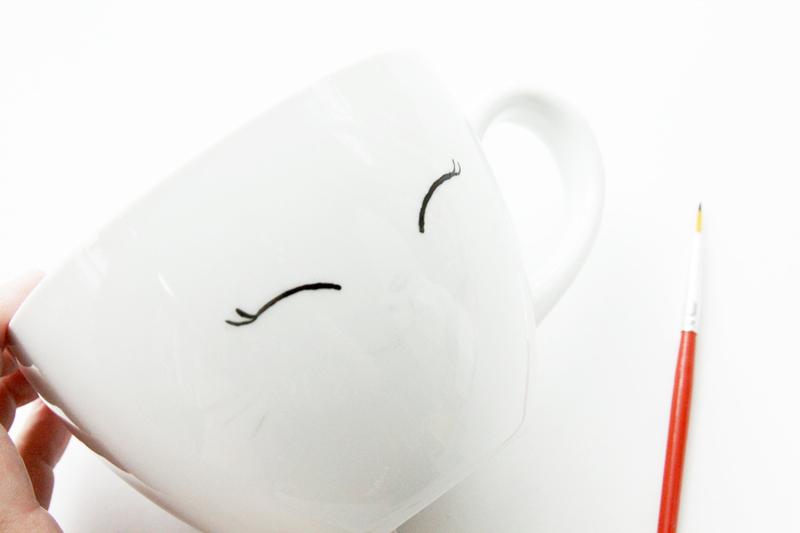 Lastly, I would LOVE to see your fabric Mod Podge mug as well. It might inspire me with some more ideas. These would make great gifts! Thank you for sharing. Hi they are so cute! I was wondering when you apply the dishwasher safe mod podge, do you ONLY need to put it over the “painted” areas? and if so HOW THICK (how many coats) do you need to put it on? So cute! My sister just got a cat so these are perfect gifts. Visiting from Made By You Monday. These are so adorable. What a great gift for any cat lover. So cute! You have such a steady hand! I can never paint tiny lines like those. Those are so stinkin’ cute! Plus you reminded me that I have a bottle of that dishwasher safe moge podge around here somewhere. Pinned. This is the cats meow!! Thanks for sharing it with SYC. These are just too cute. I need to make a few of them. Stop by Thursday Favorite Things since you are being featured. wow, great project and so great to know about these products! thanks so much for sharing on craft schooling Sunday 2 weeks ago….somehow I missed this then so am featuring it this week. all the best!